Following issues I experienced with Lantus (Insulin Glargine) in November 2014, I spent some time researching it, looking at absorption and pharmacokinetics and other users’ experiences. I reached the conclusion that Glargine has the potential to be lethal and that due to its pharmacokinetics, it may be responsible for some of the issues seen with glucose level control in users. As a result, I asked to be moved to Levemir (Insulin Detemir) and my results improved dramatically. This post documents my thinking and my findings. Around a year ago, after something in the order of 12 years using Lantus, I had an incredibly scary experience with Lantus insulin. I discovered that in certain circumstances, it can act like a quick acting insulin and cause sudden blood sugar drops. I used to split my Lantus dose, and the morning Lantus was taken at 5am, and was 15u. Having taken the Lantus one morning, I dropped from 11 (sensor) to 1.6 (finger prick as I was feeling low) in 1.5 hours. I’d done nothing different in my eating, insulin or gym work and I injected in a usual site. My story from the morning is here and three weeks earlier it had caused a massive hypo, as I documented here. Other people had had similar experiences and quite a few of them. In summary, if you inject somewhere where the Insulin is not absorbed properly into fatty tissue, it fails to work properly and effectively becomes short acting insulin. Your basal level gets messed up because the basal insulin has acted and been consumed too quickly. It is likely that I had this happen quite a lot, including the occasions where I had massive lows that needed assistance overnight. I had very irregular morning glucose levels, and variability of absorption reflects that. As a result of these incidents, I swapped over to Levemir (Detemir) and the difference in overnight glucose levels was astounding. All of a sudden I now had great plains instead of mountain ranges. And all because, for 12 years or so, I had been using the wrong insulin. As can be seen from this study, the Glargine is almost as bad as NPH for variability of absorption. It should be noted that the author of this paper has done paid work for Sanofi and Novo Nordisk, and owns Novo Nordisk shares. This paper was published in 2006. However, in 2004, there was a paper published in the ADA Diabetes Journal that found exactly the same thing. Yes folks, back in 2004, we knew that Insulin Glargine had absorption issues when compared to Detemir. And the NHS continued to prefer to prescribe Glargine, because it was cheaper. Why is this important? Well let’s consider it for a moment. If you have either low body fat or lipoatrophy (the breakdown of subcutaneous fat) as a result of years of injections, then what is the insulin being injected into? Not subcutaneous fat. And what if it isn’t injected into subcutaneous fat? Then it doesn’t precipitate properly. If, instead of creating a reservoir of insulin, and releasing slowly it is introduced into the muscle, and there is partial or no precipitation, you could have just injected a very large dose of what is effectively a fast acting insulin. Congratulations! Under these conditions, Lantus can be considered “Lethal”. On the occasion of my massive hypo, I collapsed and sprained my ankle. That process caused a level of nerve damage on the top of my foot. A kind of neuropathy. Thanks Sanofi! Once I’d ascertained what was happening, I’m afraid I yellow carded the insulin. I personally think that it is dangerous. I know that insulin is “dangerous” anyway, but for something that purports to do one thing, but in actuality can function in a way that is so different from its supposed action is astonishingly dangerous. A question this raises for me relates to “Dead in Bed” syndrome. How many of those who have passed away due to it were using Insulin Glargine? Has a connection ever been looked into? It also raises questions about those who struggle with control. 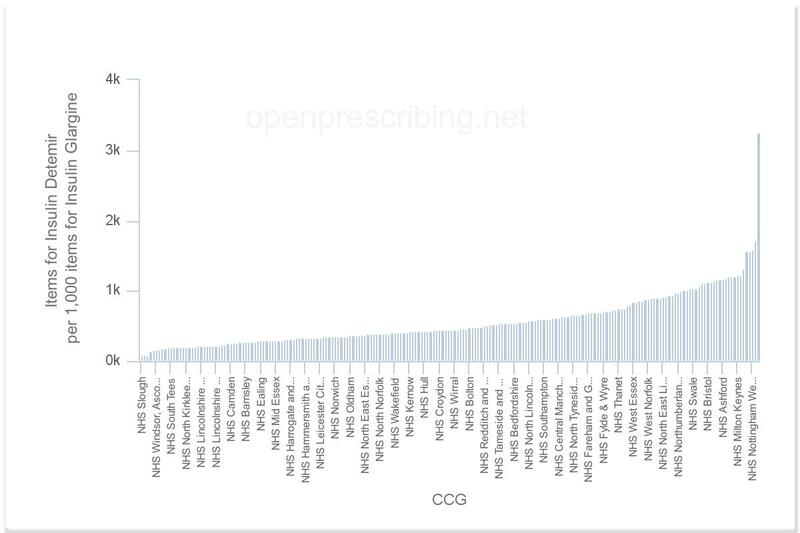 According the NHS Business Systems Prescription Costs Analysis website, in England in August 2015 (the last month on which data is available), 705,974u of Glargine were prescribed in comparison to 393,630u of Detemir. That’s nearly twice as much insulin which has long been known to have absorption variability. Should all those people be moved to Detemir? And then let’s not mention the lack of basal insulin as a result of the sudden partial absorption. And that is why I never really had a good background blood glucose level with Lantus. This variability in absorption is something that should have been more widely communicated. As Toujeo is a more concentrated Insulin Glargine, with the same Pharmacokinetics, why would it be any different? In the 2015 update to the Type 1 Diabetes guidelines, NICE recommended that Insulin Detemir is used twice daily, which, to me is a much better and safer option. Now I’m not suggesting that Glargine is bad for everyone. Many people find it works well for them and there are plenty of anecdotal examples of the pharmacokinetics of Detemir not suiting people either, but my experience of it was terrible, and the two studies I can find looking at variability of absorption seem to reflect that experience. As a result, I may have spent 10 years of my life using an insulin that fundamentally, by its normal characteristics, induced complications later in life, when there was a better alternative available. That’s quite a stark thought, and one that should be at the forefront of HCPs’ minds when prescribing long acting insulins or pumps…. I found that the problems with Lantus are very noticeable with Afrezza. Injected bolus insulin has a duration of action of 5-8 hours, so during waking hours the long tails of bolus doses contribute to the basal dose. These tails also act as a buffer for periods where Lantus has released too quickly and has consequently run out before the next dose. 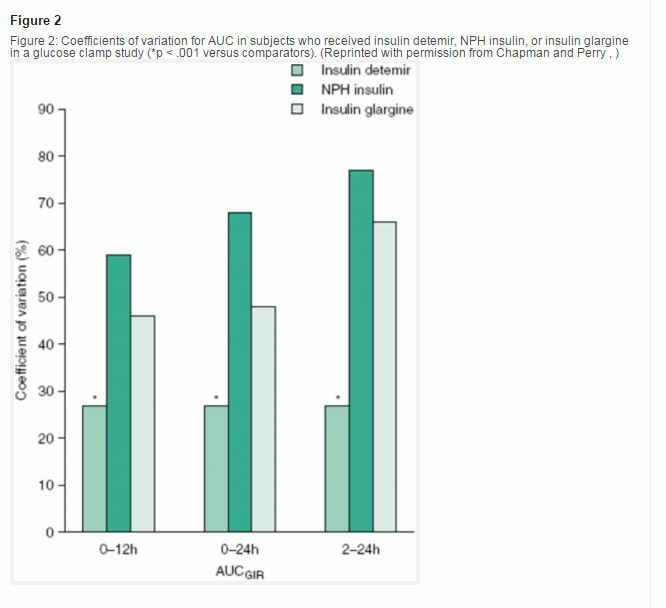 Because Afrezza is gone in half the time, there is only basal insulin between meals. I was seeing that mealtimes were often the smoothest and flattest parts of each day's graph. After reading your experiences, I thought Lantus could be causing this unpredictability between meals. Your detailed posts about your successful transition to Levemir led me to switch. The difference was night and day. Levemir gave smooth lines between meals and was incredibly consistent. Unfortunately, it couldn't last until the next dose and it had a strong peak. At least these problems consistently occurred at the same times each day, so I could be prepared. Tresiba is amazing. Four problem points on each day's graph instantly disappeared (two peaks and running out twice). I find it works as claimed, one injection a day with no issues dosing 12 hours late. I'd like to get in touch but don't know how. Thanks Matt, I hadn't looked deeply into Toujeo as it's a form of Glargine, and I had assumed as a result should have very similar Pharmacokinetics to Lantus. If you dig around a little further, the European Assessment report http://www.ema.europa.eu/docs/en_GB/document_library/EPAR_-_Assessment_Report_-_Variation/human/000309/WC500186579.pdf states that Toujeo is not biosimilar to Lantus, and there are some marked differences in absorption. "Direct switching from the old formulation of 100 U/ml to the new formulation of 300 U/ml with equal doses is not warranted by the pharmacokinetic data after single doses. However, after repeated dosing a lower Cmax is achieved resulting is a less variable plasma-concentration-time curve and a similar extent of exposure." In other words, once the Toujeo is properly in the system it seems to display less variability in concentration (and knowing that assumption is the mother of all f*** ups) and one assumes therefore, absorption. I'd be tempted to await more data on that last comment though! I am a 42 years old male, and have been a diabetic for 41 years. I have had this same phenomena of very, very scary hypos shortly after Lantus injection quite a few times, at least 5 that I can recall over the 10 years I have been using it. The last two happened within this month, and while I was alone on business trip, the first almost killed me in the hotel room in the morning, in the second, again in the morning before breakfast, I noticed it coming and managed to rush down to public area from my hotel room where people saved me by feeding me LOTS of sugars and sweets, and they called an ambulance too. In both cases, I woke up with about 125 mg/dl BG, injected my Lantus, sparing the bolus until I go downstairs for breakfast , passed 10-15 minutes getting dressed etc when I started to feel a low. 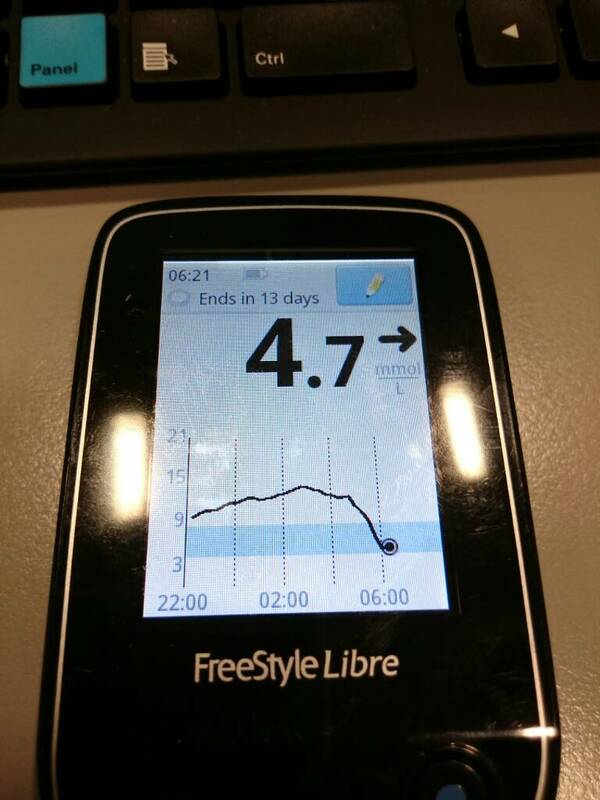 Checked my BG on using the libre sensor at my arm and see an astonishing level of 80 with a sharp arrow pointing downwards, meaning a high drop rate of BG. Based on my previous experiences I knew what was coming so I rushed to eat lots sugars, ate a bunch before I collapsed , hitting my face against the floor, unable to get up or move, until the sugar I consumed thankfully kicked in and recovered me within 15 minutes. The second case I already mentioned above where people helped me. To note, in the first case I had Lantus injected into my left arm, in the latter into my belly. In both cases I noticed blood coming off the injection spot, a thicker blood so to say compared to what I would occasionally get from my injections. I had also other cases earlier, and back then I started to think “I m hitting a vein or an area with lots of veins and it gets absorbed very fast, acting like intravenous rapid acting insulin”. I went to my endocrinologist who is quite knowledgeable and told him about the incidents I had. He did not think at all it would be an absorption issue, brushed it away so to say, claiming it would be the after effect of earlier injections, or possible over exercise earlier etc. After the recent 2 incidents I had, this week I went to a well known diabetes expert in my county who is also the head of the national diabetes foundation, told him my experiences and my theories about occasional fast absorption of Lantus. He also brushed it away, claiming it is not possible. To get rid of Lantus, I had to ask him into changing me into another basal insulin. Conclusion: doctors are not really aware of this issue with Lantus. Your paper is a good reference. It is definitely more convincing than the people’s complaints about same issue with Lantus which I read in various diabetics forums, so thanks again for that. Honestly, I believe Lantus should be banned, yes it helped e achieve better control compared to my NPH using times, but it does have the risk to be lethal!